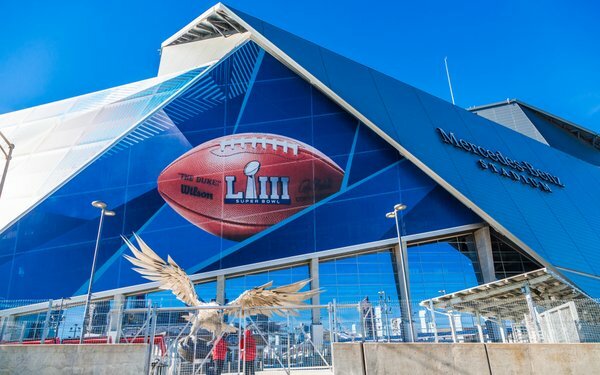 In-game advertising revenue for Super Bowl Llll sank 5% from $408 million a year ago to $382 million, according to a preliminary estimate from Kantar Media. Total advertising time in the game amounted to 49 minutes and 45 seconds -- down from the previous two years at 51 minutes/20 seconds in 2018 and 51 minutes/30 seconds in 2017. Brand advertising amounted to 37 minutes/25 seconds -- the lowest in the last five years. The NFL aired 2 minutes/45 seconds of promos. CBS, which aired the game, ran 9 minutes/55 seconds of network program promos -- the highest over the last five games. When adding in all Super Bowl-related programming for the day -- pre-game and post game -- Kantar says the event should top $450 million. Kantar says the most revenue for in-game Super Bowl advertising occurred in 2017, at $419 million. Kantar Media estimates the big parent advertiser -- for all its brands during the game -- was Anheuser Busch In Bev at $59 million. Amazon was next at $25 million; Google, T-Mobile, and Toyota Motor, each with $20 million. According to iSpot.tv, its preliminary estimates showed CBS pulled in $391 million in advertising for its Super Bowl Llll in-game programming on Sunday. Top-spending individual brands during the game were Bud Light at $23.5 million; Verizon with $20.4 million; T-Mobile at $20 million; Toyota Motors with $20 million; and Amazon at $19.4 million. Kia Motors came in at $15 million, followed by Michelob with $11.8 million and Mercedes-Benz, Audi, Universal Pictures, Marvel, Microsoft Xbox, and The Washington Post, each spending $10.4 million. Google, Hyundai, Amazon Prime Video, and Google Assistant were at $9.6 million each. Pepsi at $8.4 million, Burger King with $7.95 million, and TurboTax at $7.95 million complete the top 20 Super Bowl advertisers. Media researcher SQAD says the average ad cost range was $4,610,038 to $5,526,089 for this year’s Super Bowl.